I was really excited/nervous to do our wedding invites. 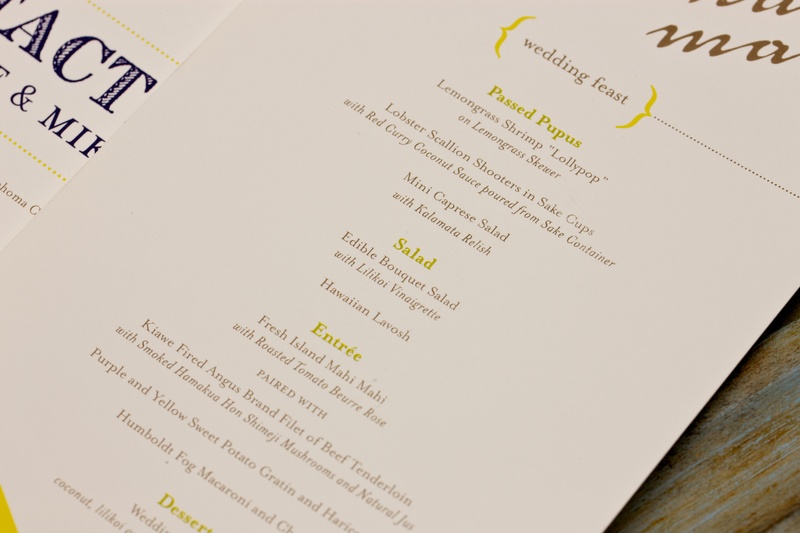 There’s a lot of pressure on designing for weddings in general, so take that pressure, add to it that it’s my own wedding and top that off with the difficulty of designing for yourself (think picky) and you have one stressed designer. 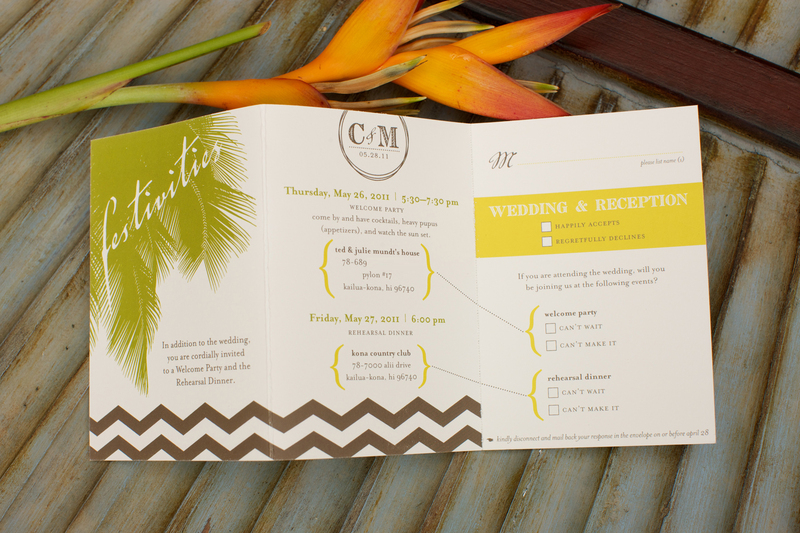 I think one of the things I was most excited about in doing my own invitations and collateral was that it would be an exact reflection of my style. When you complete projects for clients, clearly a lot of their taste and input affects the final outcome, which is not the case when designing for yourself. I’ve shown the Save the Dates in this post, but I love the photos Toby Hoogs Photography took of them, so I’ve included them first. 1. The wedding invitation. 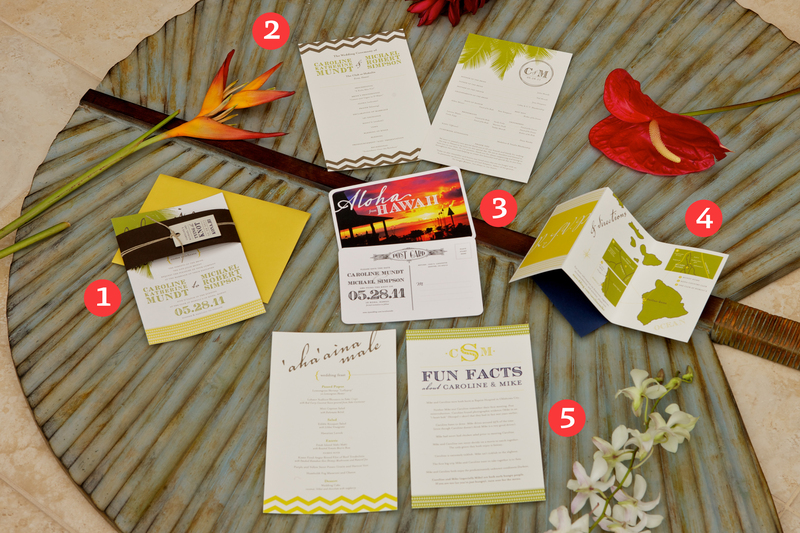 The bellyband (the brown wraparound) held in the directions and RSVP trifold (number 4) and return address envelope (the blue envelope underneath number 4) and the entire packet was mailed in the yellow envelope underneath the invitation. 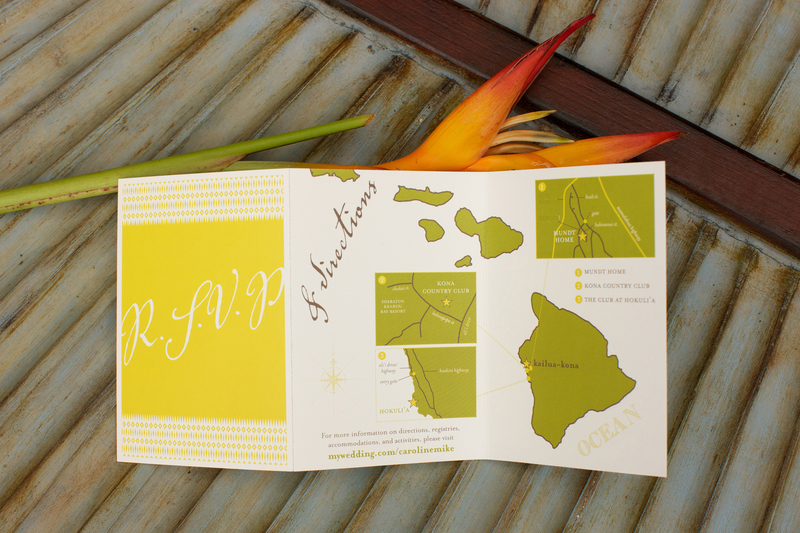 My overall vision for the invitations was to have something bright (we didn’t have “colors” per say, we just pulled some bright colors and played off the flowers), bold, and fun. 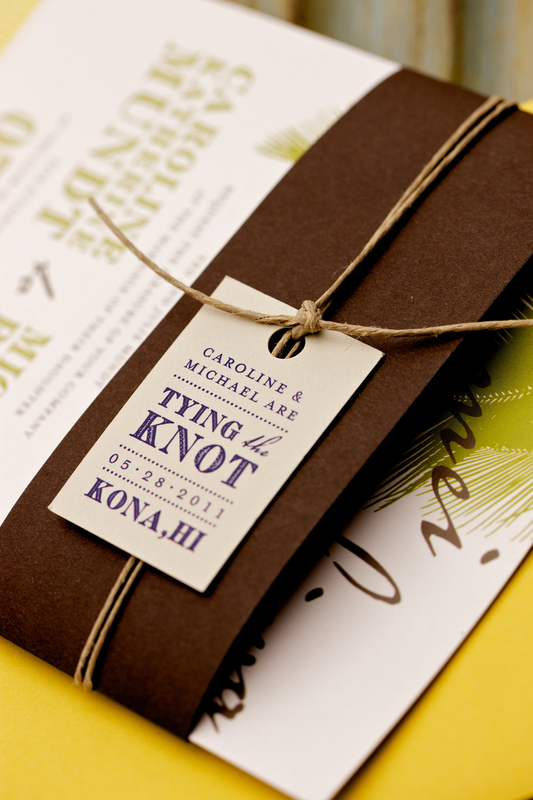 I incorporated some Hawaiian words (and the accompanying translations), a logo with our initials (a version with the date and one without), and several additional elements (including custom rubber stamps for the return address and return envelope for the RSVP’s, a hemp string to tie a tag around a bellyband to hold all the elements together, and a beautiful heavy two-tone paper). 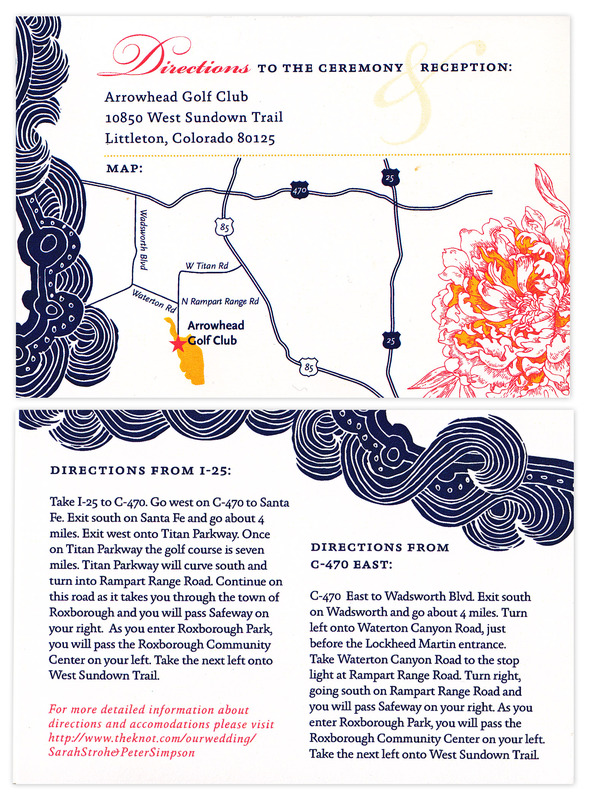 The Directions & RSVP trifold was designed so that the third panel was perforated to be torn off and mailed back to me (with responses for three events, instead of sending individual invitations). Additionally, this way the recipient could keep their directions and schedule of events, but I was able to print it all together. 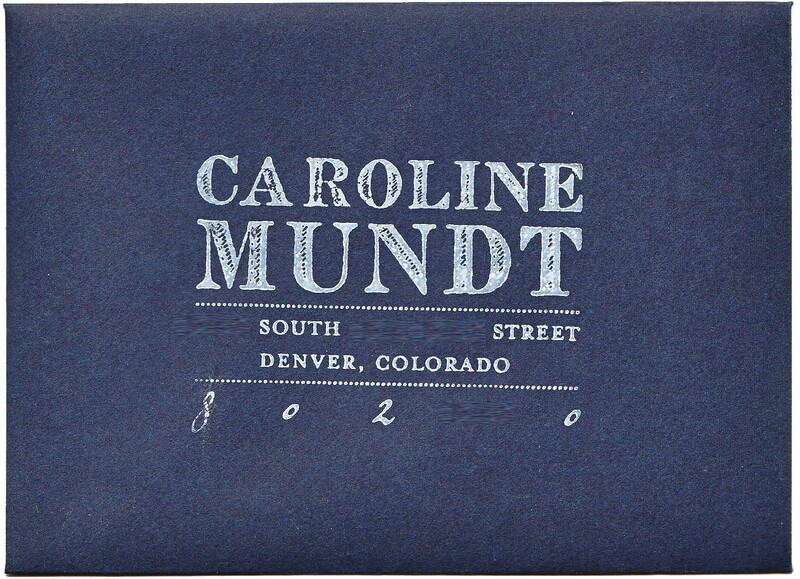 Return Address Envelope (Note: all blanks where an address would be are intentional for this post): This was done with custom rubber stamps I made for both my address and for the logo to go on the flap. 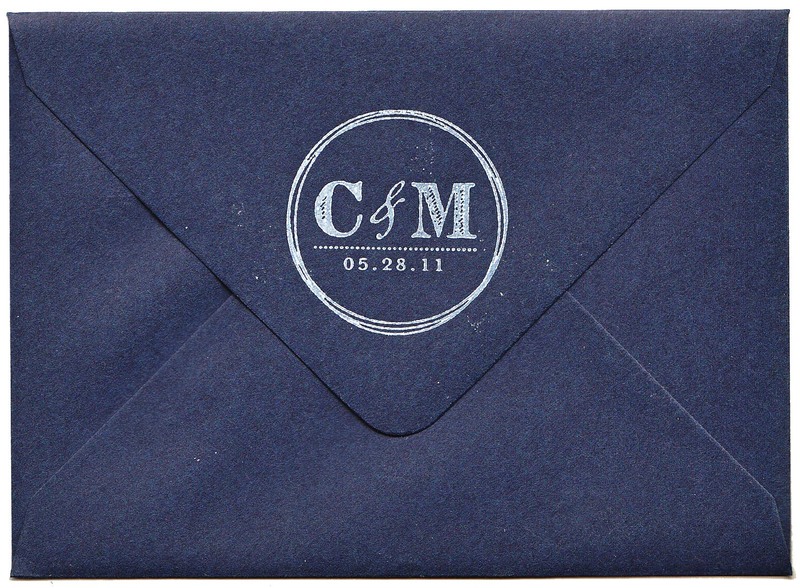 I later made a Caroline & Michael Simpson return address stamp for the thank you note envelopes. 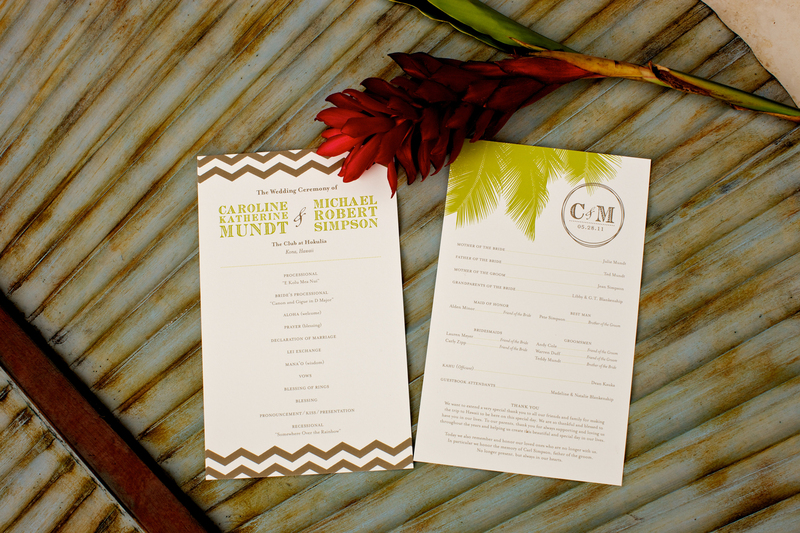 And to wrap it up, here is a glimpse of the Welcome Party cocktail napkins. I didn’t have any additional collateral at that party and this is actually a shot of it being used as a cocktail napkin for my “getting-ready” champagne. Tomorrow I’m going to break down the welcome bags we gave guests. Hope everyone had a great weekend! Last year my cousin Molly had her second baby. As it was a second baby (and their second girl) it was customary not to have another shower. 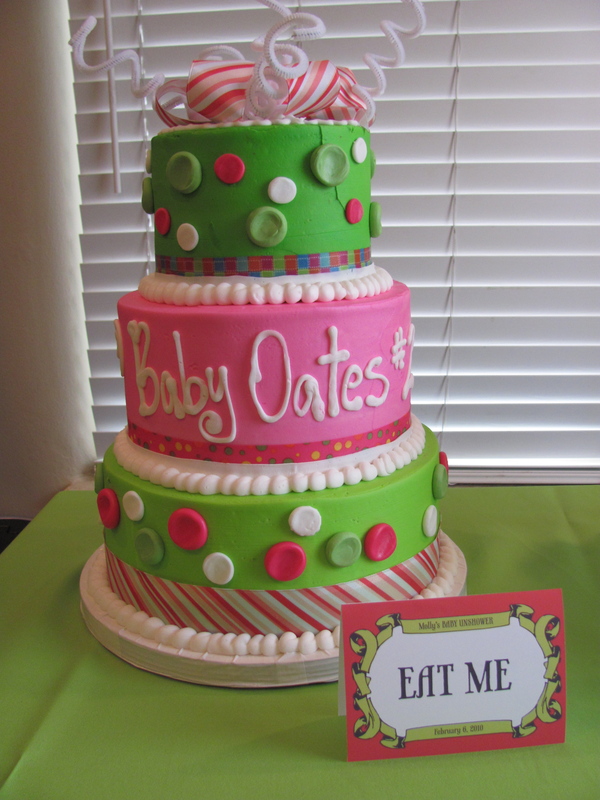 However, her sister, Melissa, wanted to throw her essentially a “welcome” party for the second little one. 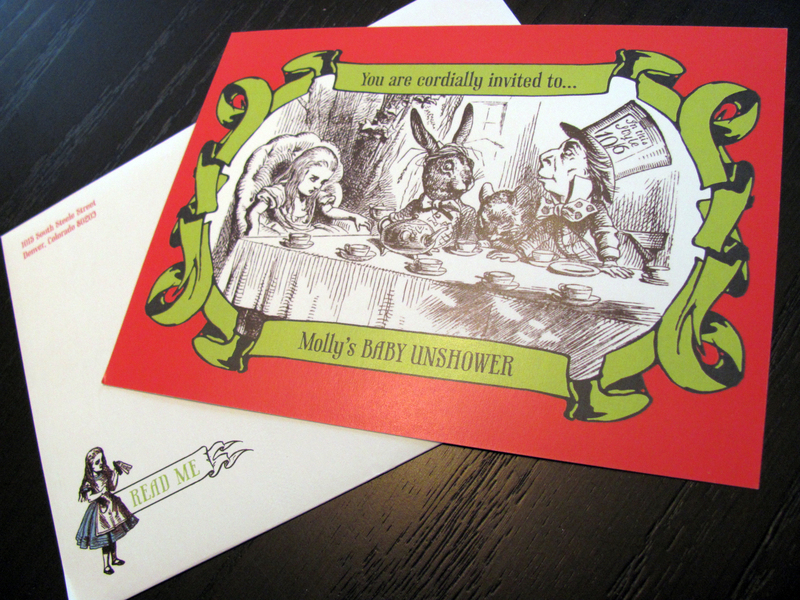 She chose an Alice in Wonderland theme and I got started on the invitations. 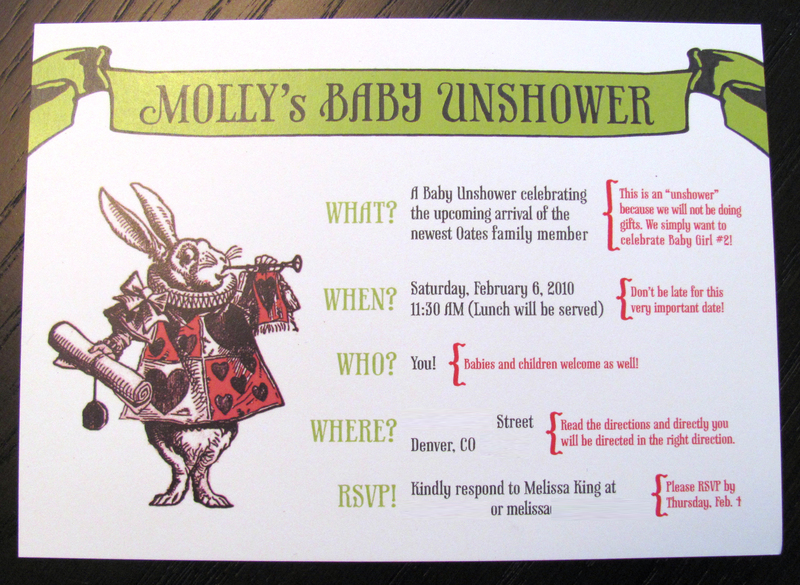 As it wasn’t really a baby shower (no gifts), we thought it would be a cute idea to call it a Baby Unshower, as Alice attended an Unbirthday Party. I included some illustrations for the original book, bright pinks and greens, and did some research on fun phrases to accompany the invitation. 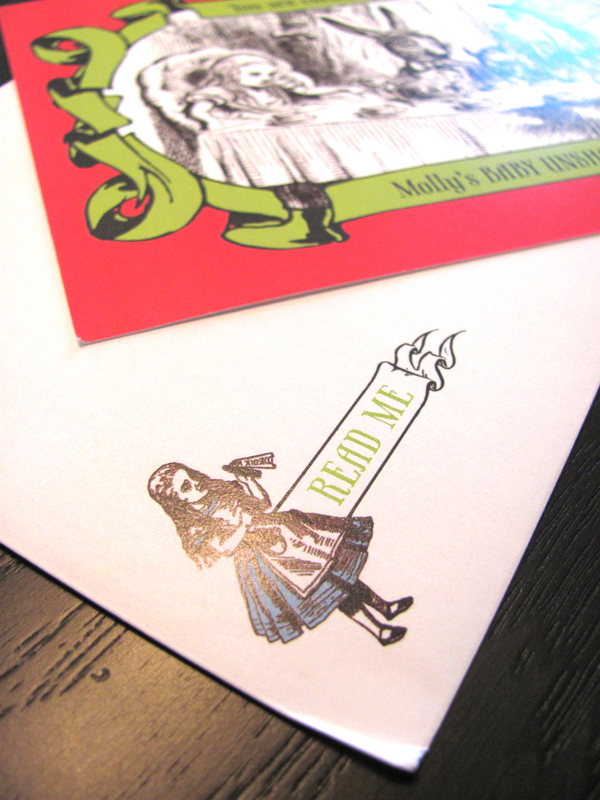 As there are several “eat me” and “drink me” signs throughout Alice in Wonderland, I incorporated this in both the envelope and a sign to accompany the (oh so adorable) cake. 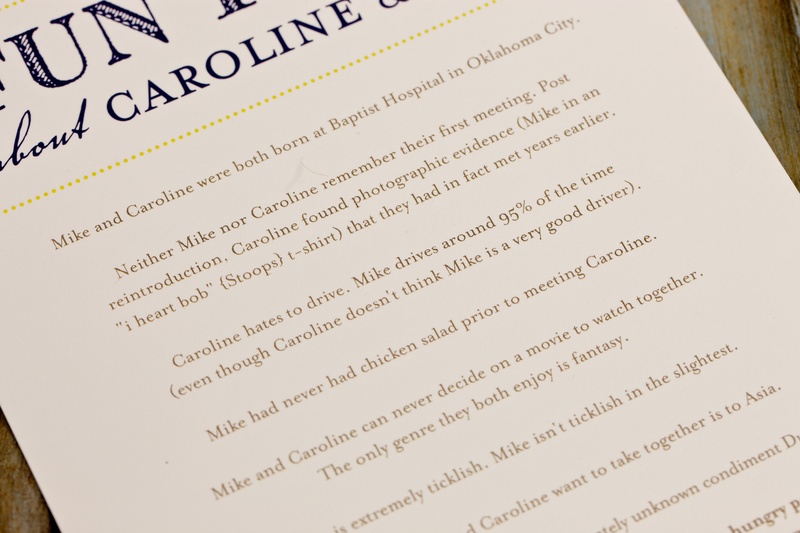 I had a really great time with the wording on the back of the invitation. Most of it are phrases from the book or movie that are slightly tweaked to be more party appropriate. Overall a really cute, fun project to work on! 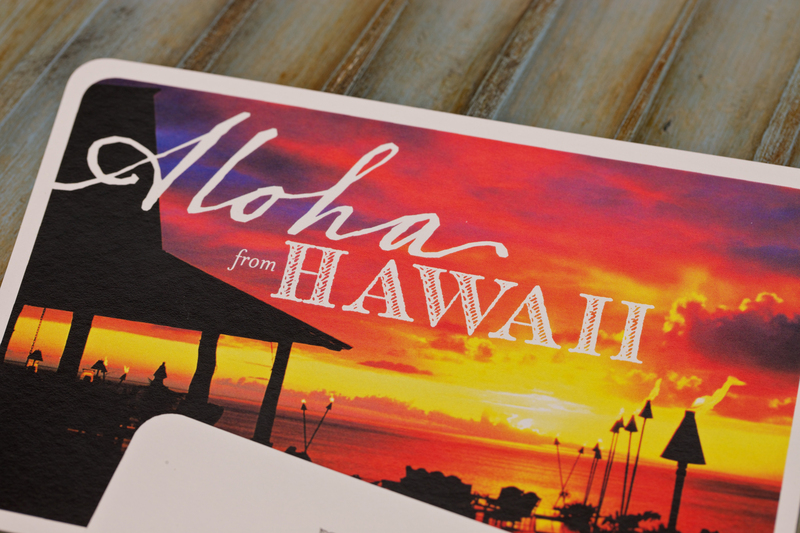 Welcome to the first “Aloha Friday”. The newscasters in Hawaii refer to Friday (ahh beginning of the weekend) as Aloha Friday. It really doesn’t change anything about the day, as it’s not a holiday. It’s every Friday. But it’s essentially a vacation mentality I wish us “mainlanders” had. 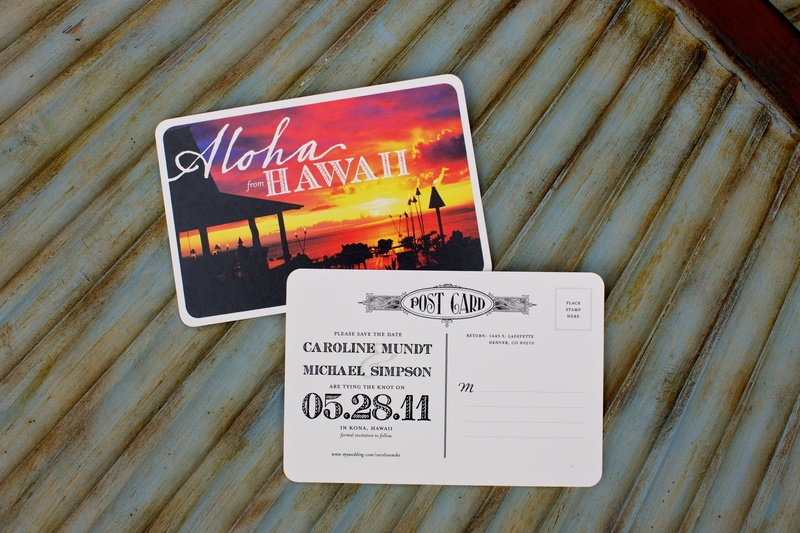 Though not all of us are lucky enough to reside in a tropical paradise, we too can have a bit of “aloha” in our lives. So I plan on using my Friday posts, Aloha Fridays, as a more open, free forum (not so strictly design oriented). Just things that interest and excite me. So right after I’ve told you that Aloha Friday doesn’t always mean design, I’m going to really confuse the matter and start things off on a design oriented post. Aloha Friday also does NOT mean it will always be island related (as I said, it’s more a state of mind, than literally mai tai’s and waves). 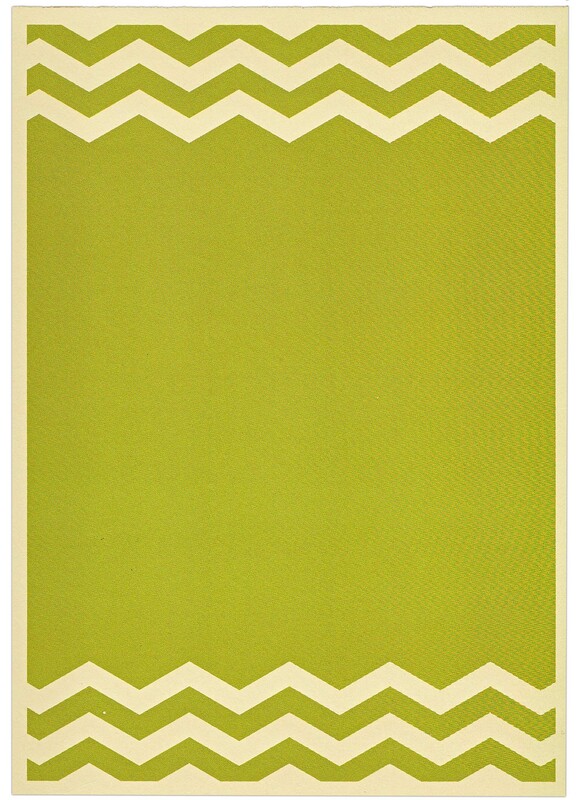 However, today’s post is both design and island related. 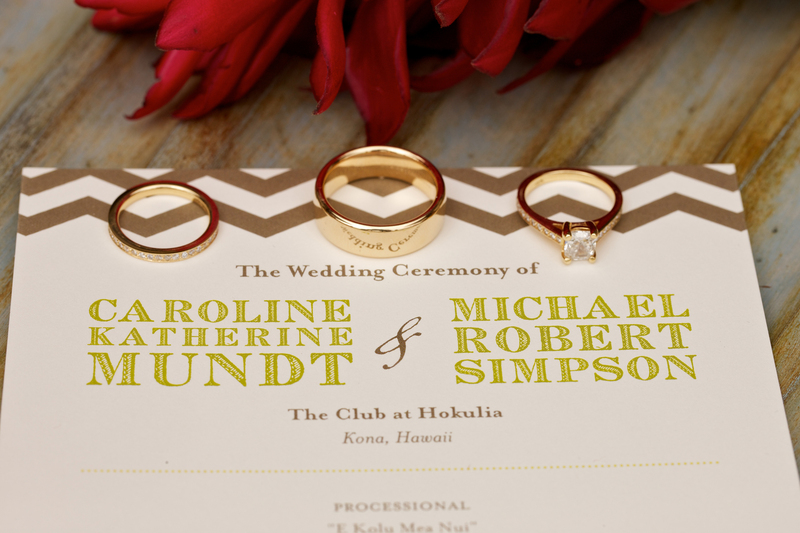 As I’ve mentioned, I’m getting married in Hawaii in May. 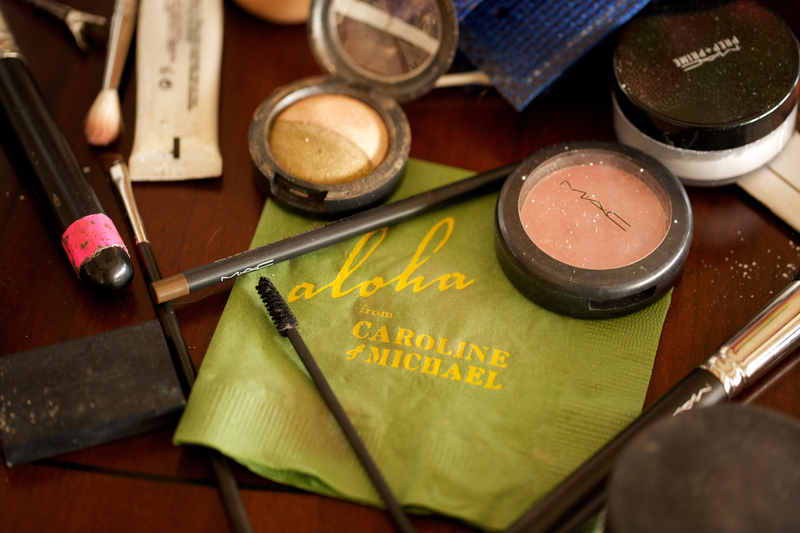 I’ve always been intrigued by the vintage Hawaiian look. There’s something so classic about it. 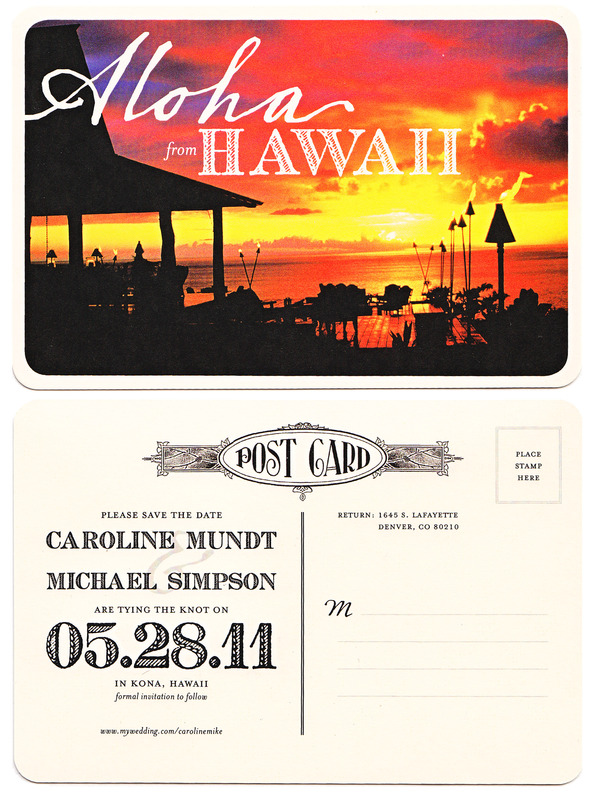 So I knew right away (and by right away I mean after we deliberated where the wedding would actually take place) I wanted our save-the-date to resemble a vintage Hawaiian postcard. I decided to use an actual image on the front after searching through countless terrible stock illustration. The fonts are some of my favorites (I won’t bore the masses, but if you’re interested, message me and I’ll tell you the names) and I think overall the look is exactly what we wanted. I’m all about the details. Though no one could see the “place stamp here” message under the stamp, I knew I wanted it to aid in authenticity. 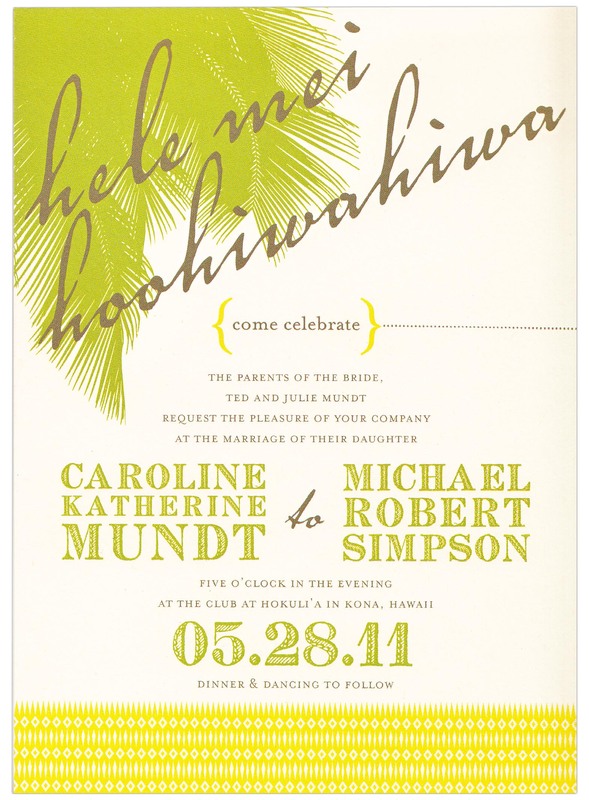 I was also quite pleased with the fact that the image chosen on the front is our actual venue, Hokulia. 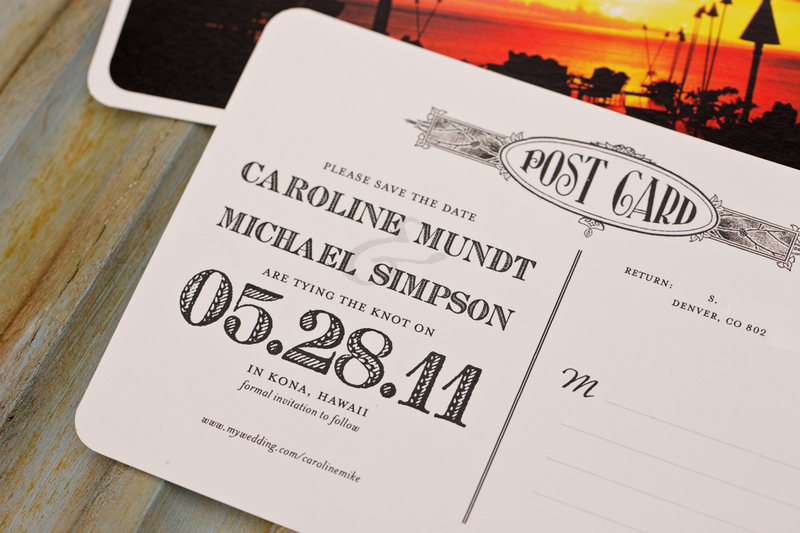 Using an image of the actual venue was an excellent way to excite guests. Anyone need any save-the-dates designed? I’m available for hire and love doing them! I design everything from logos to websites to billboards, but I must say wedding invitations are quickly becoming one of my favorite projects. 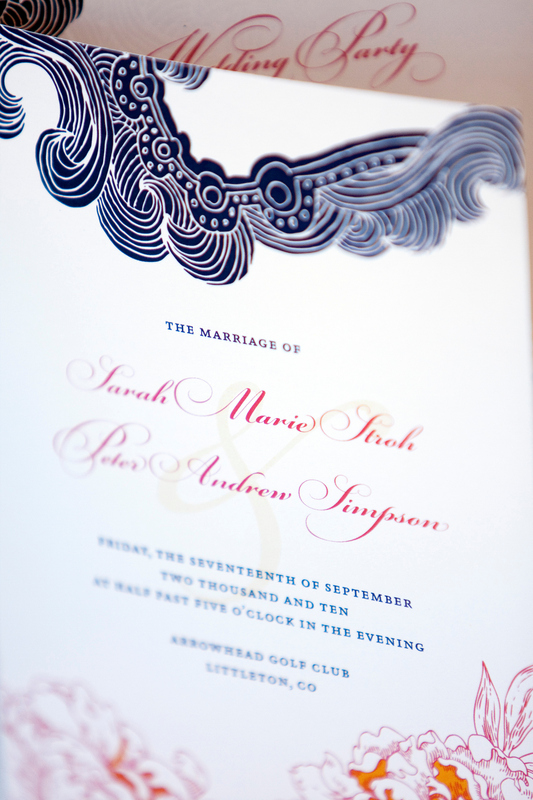 Last summer I had the distinct pleasure of designing the wedding invitations and collateral for my future brother-in-law, Pete, and his fiance (now wife), Sarah. 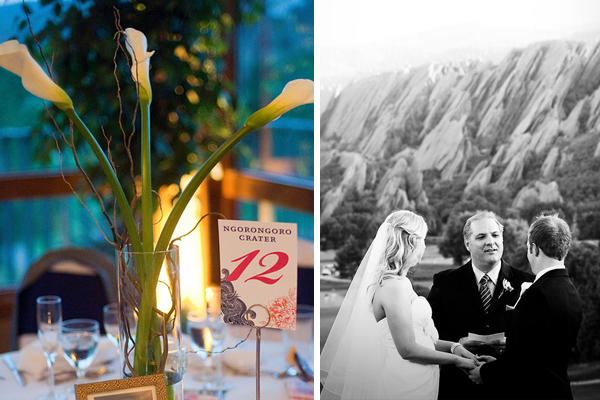 Their wedding (which took place last September) was warm and inviting at a gorgeous venue, Arrowhead Golf Club. With huge jutting rocks in the background, it was a modern, yet classic vibe, all of which was enhanced by the richness of a Colorado fall day. 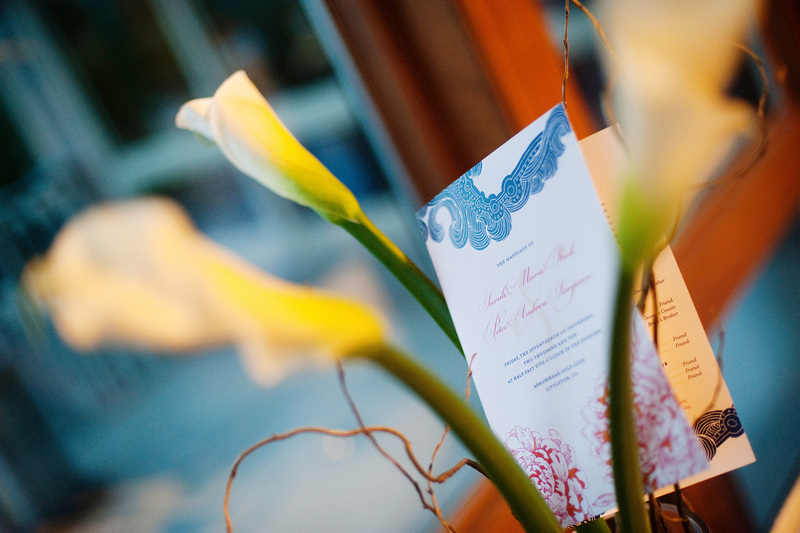 Sarah and Pete wanted that same modern, yet classic feel in their invitations, which inspired the collaboration of the traditional peonies, the free-form illustration, and the bright color palette. 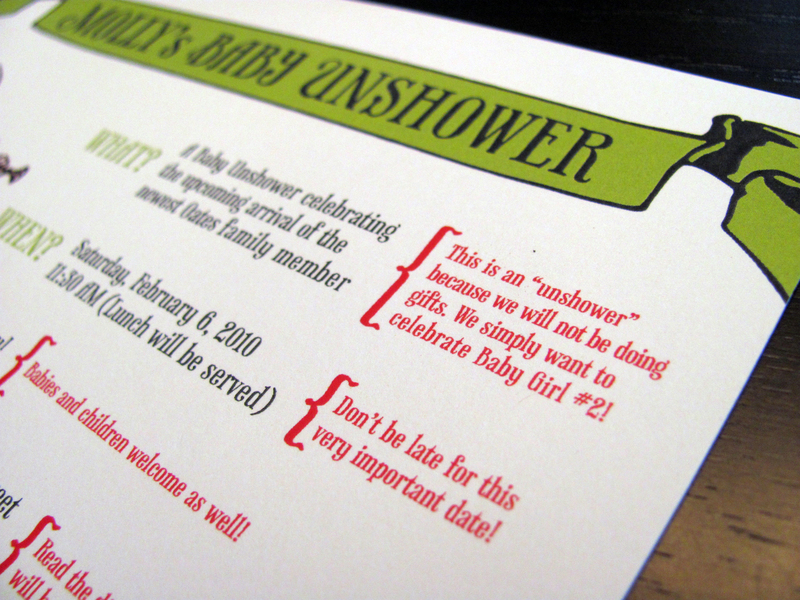 Invitation and RSVP card above. Two sided directions card below. 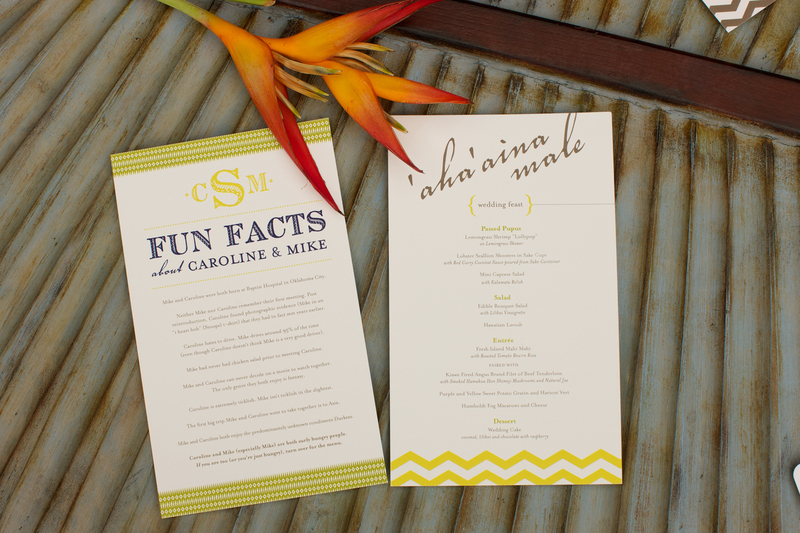 Other collateral included programs, table numbers, guest book, and cd inserts (which they gave out as favors). The stunning venue. 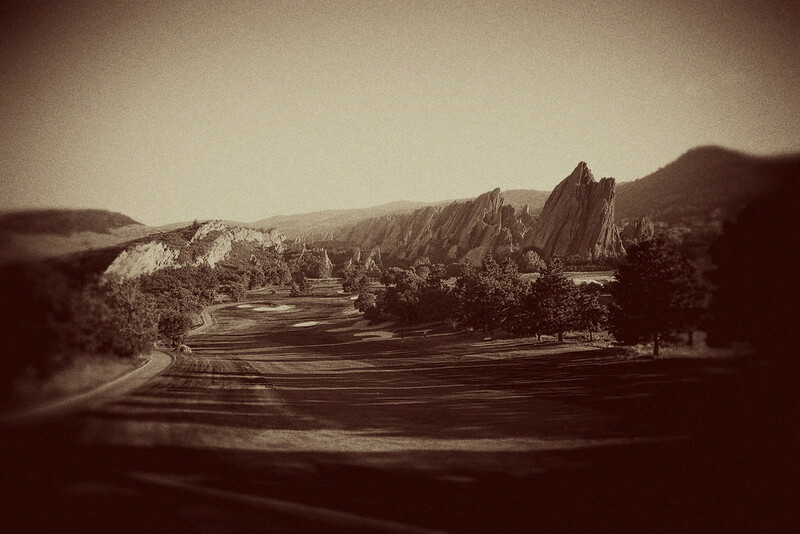 Seriously, this could be a postcard. It’s scenes like these that make me LOVE living here (after all, I did grow up where the wind goes sweeping through the plains). Photos above taken by Kara Pearson.